U.S. transportation officials ordered the Metro-North Railroad last Friday to quickly overhaul its signal system and temporarily put an extra worker in the driver’s cab on some routes that have major speed changes, including the one where a speeding commuter train derailed on Dec. 1, killing four people. The emergency order by the Federal Railroad Administration was a reaction to the Dec. 1 wreck in the Bronx, where a train flew off the tracks after hitting a curve at 82 mph, nearly three times the 30 mph speed limit. The lone train operator told investigators he nodded at the controls and didn’t apply the brakes until it was too late. There was no system in place to ensure he didn’t miss the spot where he had to slow down as the curve approached. Engineers are required to know speed restrictions by heart, but there are no flashing lights, or even signs, to remind them to decelerate. “While we assist the National Transportation Safety Board in carrying out its investigation, this emergency order will help ensure that other Metro-North trains travel at appropriate, safe speeds,” U.S. Transportation Secretary Anthony Foxx said in a statement. The order gives the railroad, which operates between New York and Connecticut, until Dec. 31 to provide the Federal Railroad Administration with a plan and target dates for modifying the existing signal system so trains will automatically slow down in places where the speed limit drops by more than 20 mph. Until those signal changes are made, the order will require the rail line to put at least two qualified workers in the operator’s cab on sections of track where speeds vary. On some routes, this may mean that a conductor can head to the cab and accompany the engineer for a few minutes when the train is approaching a slower zone. On others, there will have to be an extra crew member who makes the whole trip because the operator’s cab is inaccessible from other train cars. The extra workers will be required until the railroad upgrades its existing signal and automatic control systems in a way that will deliver “adequate advance warning” of speed restrictions, federal officials said. “These modifications will help prevent another over-the-speed-limit event if a locomotive engineer fails to take actions to appropriately slow or stop a passenger train,” the railroad administration said in a statement. The Metropolitan Transportation Authority, which oversees Metro-North, said it would comply with the order. The federal agency gave the authority until Tuesday to identify all the spots in the system where there is a 20 mph speed variation. MTA officials couldn’t immediately say how many extra workers they might have to add or whether doing so would pose a challenge. They said they were examining other steps to improve safety following the crash. “We understand your priorities and will continue to work with your staff to identify the most appropriate and expeditious technological and operational solutions to address the hazards revealed by the December 1 derailment,” MTA Chairman Thomas Prendergast wrote to FRA Administrator Joseph Szabo last Friday. Separately, Gov. Andrew Cuomo said last Friday that he had asked the MTA to make several safety changes, including expediting speed controls for areas vulnerable to crashes on the Metro-North and Long Island Rail Road commuter systems. Cuomo also wants to accelerate efforts to install technology called positive train control, which can automatically bring a train to a stop if it’s exceeding a speed limit. Railroads are facing a congressional deadline to install such systems by December 2015. The MTA has been installing the technology, at a cost of hundreds of millions of dollars. William Henderson, of the Metro-North Railroad Commuter Council, a passenger advocacy panel, said the drive for better technology is welcomed but he’s unsure how much the process can be accelerated even with Cuomo’s urging. He said positive train control could improve safety but the technology hasn’t been tested on a high-volume commuter rail. 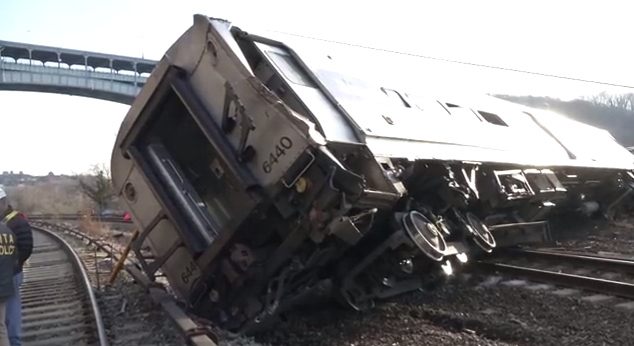 Funeral services were held Dec. 6 for two victims of the derailment. Jim Lovell was a sound and lighting expert and technician on NBC’s “Today” show who had been on his way to work on the Rockefeller Center Christmas tree. Donna Smith, a paralegal, had been going to hear her sister sing a holiday classic, Handel’s “Messiah,” with a choral group. Associated Press writers Michael Gormley, in Albany, and Jim Fitzgerald, in Cold Spring, contributed to this report.